Lismore A.F.C. 's last game was a poor 3-0 loss away against Brideview United. Mogeely F.C. come from a crushing 1-7 win away against Kilworth Celtic. Prediction: Home Win for Lismore A.F.C. 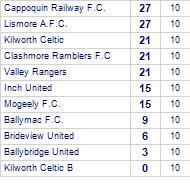 Kilworth Celtic's last fixture played was a confident 0-3 win away against Ballymac F.C..
Mogeely F.C. come from a disappointing 3-1 loss away against Cappoquin Railway F.C..
Mogeely F.C. despatched by Cappoquin Railway F.C..
Cappoquin Railway F.C. has yet to be beaten in this competition, having won 10 out of its last 12 games.